Mia can't wait for this year's Winter Festival in her hometown of Flurry, Vermont, and she's hoping to get her picture taken in a sled at the parade just the way her mother and grandmother did. But this year, there may not be any snow! If the festival is canceled, this could mean bad things for her mom and stepdad's hotel, which relies on this yearly surge in business. 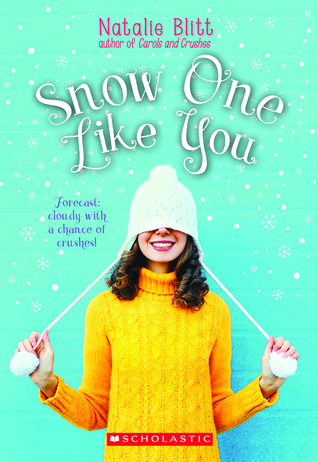 Her best friend Lark doesn' understand quite how important the festival is, but Mia finds an ally in Yoshi, whose father has moved the family to Maine to escape the pressures of being a weatherman in California. Mia has to deal with her young step siblings and her free spirit dad and his wife. Mia tries everything she can think of to keep the festival moving even if there isn't any snow, but will she be able to save the day? Strengths: Clearly, when I read the Scholastic Book Club flyer I was sucked right back into 7th grade and felt an overwhelming compulsion to order this. The cover is cute, the story has the right blend of girl power and romance, and it has an "exotic" setting for someone in Ohio. Considering that Taylor Garland's two Celebrate the Season books have been going out every single day, only to be returned by a girl who has brought her best friend with her so the friend can check it out immediately, I am not the only one charmed by these upbeat holiday themed stories. Weaknesses: This is one of those books that is only available in paperback from the Scholastic Book Clubs. NOT FAIR!!! I want a pretty hardcover for my library! What I really think: Waiting desperately for a prebind to be available from Follett. Yes, the cover does pull in the middle grade girls. Not sure if the story would appeal to boys but I'm going to read it and find out. Thanks for all your stellar reviews this week. Very cute cover, reminds me of the Willow Falls series. Sometimes you want a light book in which nothing terrible happens such as this one. I really love that cover! It screams buy me! I love Vermont, but have never been there in the winter. So, I'd find this book very appealing! I live in Dayton, OH. Didn't realize we were neighbors or sorts. Okay, you've sold me on this one...I think my sixth graders will love it, too. The cover really is cute, and I can think of a few younger cousins of mine (and my tutee!) who would definitely be interested in a book like this. And oh, yes, the struggles of finding a book you love and not being able to get your hands on the hardcover! I do realize that its the story that matters within a book... but nevertheless the fact still remains that hardcovers look so much better and last longer than paperbacks. Great review! Awww. This sounds like a really sweet book. The cover is great too. Thanks for telling me about it. The story kind of makes me think of the old movie White Christmas!